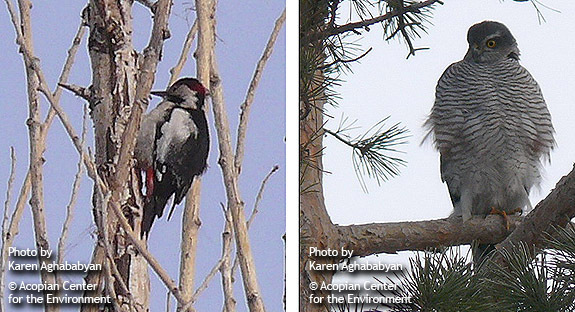 Acopian Center for the Environment (AUA) in cooperation with volunteers and enthusiasts from different fields, organized winter bird count in Yerevan Botanical garden. Botanical garden is one of the largest green territories in Yerevan city with half-wild oases. There are several notable species of birds breeding there, such as Levant Sparrowhawk, Hobby, Long-eared Owl, Syrian Woodpecker, Golden Oriole, Common Nightingale, Greenfinch etc. Food availability compels winter bird species to come down and stay in the garden during the winter. to show our participants how interesting the birdwatching can be. This count gives us an opportunity to record strictly wintering bird species such us Redwing, Fieldfare, Common Goldcrest, European Siskin, etc. 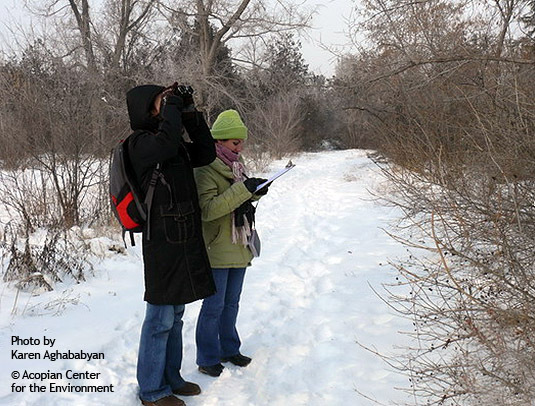 Participation in winter bird count is a good experience for beginners: “Bird Identification Training”’ (ACE) students, student-zoologists and enthusiasts, who are interested in birds. This gives them an opportunity to study linear bird count technique and to improve bird identification skills. Every year about 8-12 young people join our winter bird counts.